Published by Reach Publishers, Wandsbeck, KwaZulu-Natal. The author is a retired Warrant-Officer (Class 1) of the former South African Defence Force. This eyewitness account is a must for the serious collector and researcher of the revolutionary wars in Southern Africa. 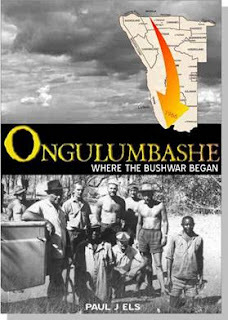 This book describes the first clash that took place between elements of the South African police, army and air force on the one side and SWAPO's Plan soldiers on the other side. The foreword was written by a former Commander of the Security Branch in SWA and a Commissioner of the SA Police, General J.V. ‘Johan’ van der Merwe while the epilogue is written by former Chief SADF General J.J. ‘Jannie’ Geldenhuys. The Book contains 290 pages and is well illustrated with photographs; many are published for the first time! The book also describes how members of the Security Branch of the SA Police infiltrated the area as employees of PASCO ostensibly a private company. (The name PASCO is derived from South African Police = SAP = PAS + Company = PASCO). A special agent is recruited and the Security Branch spy and infiltrate the terrorists. All this action leads to the arrest and conviction of several terrorists. This humble operation ‘Blouwildebeest’ leads to a bitter and sophisticated war in South Western Africa including Angola. A worthwhile read and a nice addition to the bookshelf. In South Africa the book sells at ZAR200 (p & p included) and is obtainable from the author at e-mail: "Paul Els"